I tasted the kombucha yesterday and it could have (should have?) been bottled yesterday but I had a busy day and it was NOT possible. So the taste today compared to yesterday didn’t seem like that big of a difference, but I am not a connoisseur yet and can not determine what this 2.7 ph is on my tongue. I could easily smell it when the jar was in front of me. I sterilized my 16 fl oz glass EZ cap bottles and with clean hands played with my new baby.The baby was so white and slippery like jello. I could feel the newest layer of growth on it, it could have been easy to pull off. The mother got darker and they were connected by a strange filaments that reminded me of seaweed. I’m going to do my next batch without separating the mother from the baby to make the baby stronger. Then I’ll pass the mother on to an awaiting classmate who wants some kombucha action of her own. So the mother and baby are patiently waiting for their new home in a mason jar in the fridge with about 12 fl oz of the current batch. I filled all the bottles differently and labeled them to see if any of them burst or if the taste is affected. I’m quite the refiner. I made a small batch of strawberry ginger simple syrup and added different amounts to two bottles. Watch out, Wonder Drink company, I’m going to learn it all on my own! So my 3 liter batch filled exactly 5 pint bottles, and they will sit for 5 days for fermentation number two, where the carbonation will get more intense and the acidity should mellow out while the kombucha becomes a bit drier. We will see if that will be the case. Combine all ingredients in a small saucepan over medium high heat. Stir until sugar is dissolved and mixture reaches a boil. Reduce heat and simmer for about 5 minutes. Strain strawberry pulp and ginger. 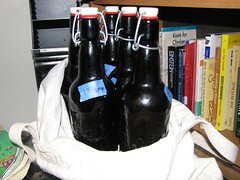 Add 1 Tbl per pint bottle of kombucha during the bottling process. Syrup will keep for a long time covered in the refrigerator. It’s delicious! I can’t wait for the next batch.